There are plenty of peculiar behaviors about the manta ray that have researchers curious and onlookers in amazement. The most common one is them jumping out of the water, called breaching. Their entire body will come out of the water and they may do a head first or tail first dive back into the water. Sometimes, they will do somersaults before they go back into the water. During certain periods of time, there will be large groups of manta rays that gather for food and for the warmer temperatures of the water. They can put on quite a show with one after another performing these types of leaps. It isn’t really understood what the role of it is in terms of attracting a mate or playing by imitating each other. Therefore, there is very little information offered about their social interactions with each other. The live of the manta ray is generally isolated. They spend very little time with each other unless they end up in the same location for food. They don’t have issues with territory or hierarchy since they are migrational and they live alone. They tend to really ignore each other with the exception of mating. 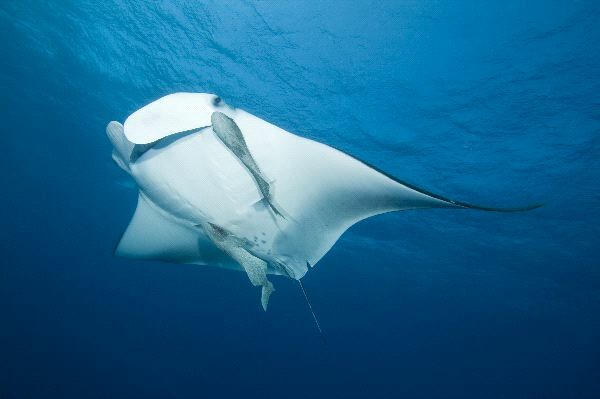 The manta ray has to go to a cleaning station on a regular basis. This will help with removing parasites and dead tissue. The cleaning station consists of small fish that will feed off of them for a period of time. 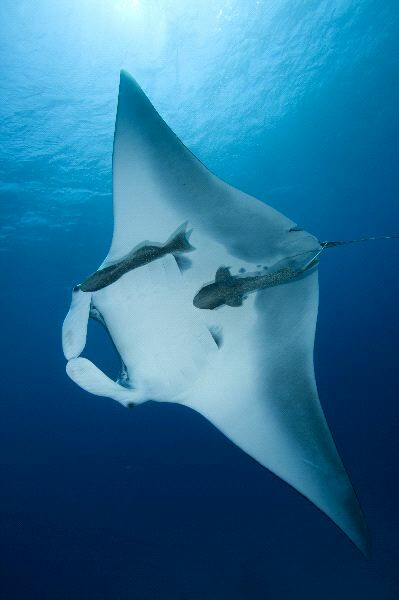 The manta ray has to continue to swim while this is taking place so they may move from one cleaning station to another for the job to get done successfully. They spend lots of time chasing each other when they are looking for a mate. They do this during the day in the water that is clear and open. Mimicing the behaviors of others may be a key part of them attracting a mate. They may just be spending some time socializing, but for the most part they live isolated. One of the mysteries about the manta ray is if they sleep or not. There have been some experiments to see if there are changes in the brainwaves of them at certain periods but they haven’t been confirmed. They have to swim all the time so movement can be used to detect sleep or not. It is possible that they partially sleep though and that one part of the brain shuts down at once for that to occur. They have been seen diving as far as 100 feet into the water. However, it isn’t known if they have the ability to dive further than that or not. What is interesting is that while they don’t interact much with each other, they do with various fish, sharks, and dolphins. They aren’t dangerous to humans in terms of stinging or anything, but early movies from the 1930s combined with the appearance of them has given people the wrong idea about them. Since they are related to sharks and to sting rays, then people don’t get a good impression of them. However, they are very unlikely to bother a person unless they are being provoked, they are trapped in a fishing net, or they feel that they have to protect themselves for some reason. Otherwise, they will leave divers alone, stay away from people, and go about their own business in the water. There is still a great deal of mystery surrounding the behaviors of the manta ray. Yet the funding hasn’t been there for such evaluations to take place on a large scale basis. Hopefully, one day we will have more information about them and their behaviors.